[Limited starting June 2017] I'll admit it, I was not amused when GrubGrade posted the news about another cereal shake at Burger King. Granted, I get the marketing progression here. Let's cycle through popular cereals because the reality is that a lot of these shakes are going to be one and done with little chance of repurchase. So this shake is on our Nosh or Not list for Episode 106 and I said that as a consumer, I would skip over this one because I found the froot loops shake too potent. That said, as a reviewer, yeah, I'll spend a few dollars on a click bait product like this. 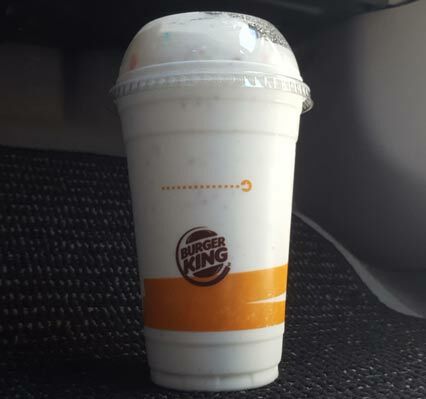 Imagine my surprise when I actually liked this shake at first and then continued to like it as I finished it with my chicken sandwich meal (yes, I still totally dig the new BK crispy chicken sandwich). The froot loops shake wore me down and I couldn't finish it, but I got through about 90% of this one. By the end, I was just too full and not willing to shove in the final sips that were full of somewhat mushy cereal bits that had gathered at the bottom of my cup. Where as the froot loops shake was just this sickeningly sweet mess of fruity flavor, this one is a bit more balanced. Yes it's still sweet, but it's a marshmallow sweetness (which I enjoy in general) with an added oat cereal complexity that worked surprisingly well for me. I can't say I would run off and get this by itself, but it fit in pretty well with my salty fries and crispy chicken. So, to recap, it's a potent shake. Lots of flavor, lots of sweetness, and basically it's marshmallow flavoring with an oat back end. I've had way too many fake marshmallow flavored things in my life but this was kept decently in check. 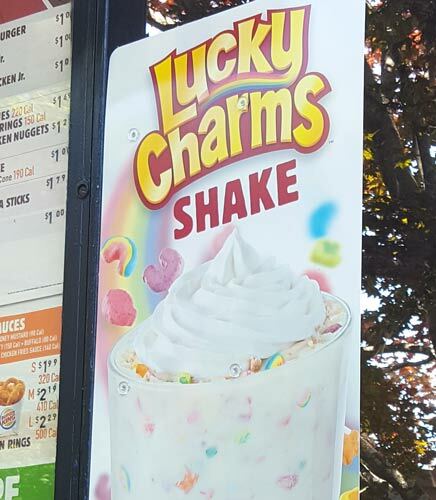 Note: Unless my eyes deceived me, it seems like adding a vanilla shake to a value meal adds a dollar but adding the lucky charms shake adds $1.60. I went to BK with my cousin solely to get this shake. Me being me, I just had to get creative- I ordered the Oreo shake but with the Lucky Charms syrup instead of vanilla and she got the Lucky Charms shake as is. Hers was tasty, but mine was amazing. I highly recommend a Marshmallow-y Oreo shake. Frosted Lucky Charms, they're magically delicious! Haha 80s jingles for the win. I enjoyed this a lot. I love cereal - lucky charms was extra special in my family because my parents only bought it for Christmas and birthdays. I think Burger King pulled this off quite well. There was no doubt what flavor it was.